Hanoi (VNA) – The Vietnam Academy of Science and Technology (VAST) should spare time studying the application of scientific achievements into reality, especially in production, business and start-up. 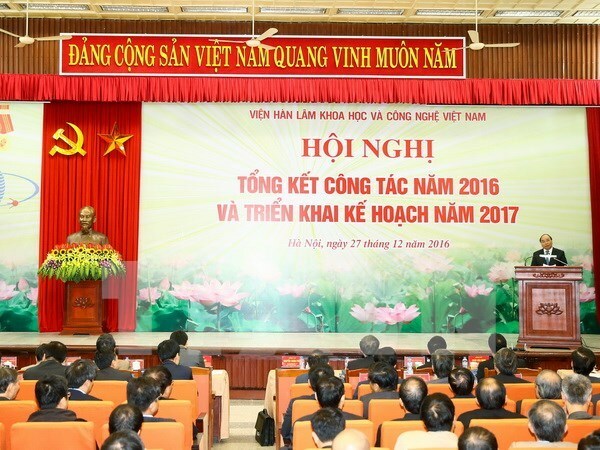 Addressing a conference in Hanoi on December 27, Prime Minister Nguyen Xuan Phuc pointed to existing problems in scientific research, including impractical studies. He said local scientists are busy pursuing unattainable issues without noticing down-to-earth needs of businesses. The PM asked the VAST to study the reasonable use of mineral resources to increase value and avoid national resource waste. He urged the academy to put forth scientific and technological measures to monitor, control and handle the environment and address consequences caused by climate change, as well as create environmentally-friendly products, reduce production cost, and increase competitiveness. The Government leader suggested applying science and technology into processing and food preservation while expanding high added value chain for farm produce. He told the VAST to increase the competitiveness of such key sectors as hi-tech agriculture, nanotech, artificial intelligence, and new-generation material production. In 2016, the VAST has announced a total of over 2,000 fundamental scientific works, including 996 published on international journals. The institution has presented 28 intellectual property certificates, encompassing 11 inventions and 17 useful solutions, representing a year-on-year increase of 56 percent, and published 39 monographs. Units under the VAST have conducted 1,070 scientific and technological contracts worth over 233 billion VND (10.23 million USD), up nearly 17 percent against 2015.